Every 100 years, a male is born into the Gerudo race. That male is destined to become the leader of the Gerudo. We all know the legend. But in the meantime the Gerudo choose a leader who they feel is worthy. And in the era of the Hero of Time, that leader is Nabooru. Of all the thieves, she is the most cunning, the most stealthy. She embodies everything that the Gerudo believe in, and exemplifies the qualities of a just leader. Her people have the utmost respect for her. But why was she chosen as their leader, especially seeing as she opposed Ganondorf with such furor? Let’s take a closer look into Nabooru, and see just what it is that makes her worthy as the Sage of Spirit. The Gerudo Fortress, located in the vast desert and heavily guarded from all non-Gerudo, is the central location for Nabooru and her people. They sneak about, stealing to keep they society running. They city consists of two training grounds and four prisons, demonstrating the seriousness of their society. They are a very disciplined people, and command respect wherever they go. And these people follow Nabooru without question. That’s not to say that her followers shouldn’t question her. For you see, the Gerudo follow two leaders: Nabooru and Ganondorf. And for the common woman, following one is akin to following the other. This is where Nabooru’s cunning comes into play. When we first encounter Nabooru she is in the Spirit Temple, looking for an object that can aide her in defying her King. But this defiance is kept a secret from everyone, because she knows all to well the price of treason. That is why she puts her trust into a hylian child, who she happens by at the Gerudo’s sacred Temple. This is where we can see the mastermind that is Nabooru. When Link is caught in the Gerudo Fortress, the guards actively try to stop him. But when Nabooru catches a young Link, her mind starts working. She quickly formulates a plan to use the boy, save the consequences. She has come across a delima of a very small entrance leading to where she needs to go, and crafts a plan to use this child to get the treasure for her. Does she know that this boy is a skilled swordsman? Does she realize that the rest of the temple is full of puzzles and enemies that will seek to harm this child? I believe she does. I believe she knew that Link was capable of taking care of himself simple because he was at this forsaken temple in the middle of the desert. No ordinary child could have possible made it this far unless there was something special about him. 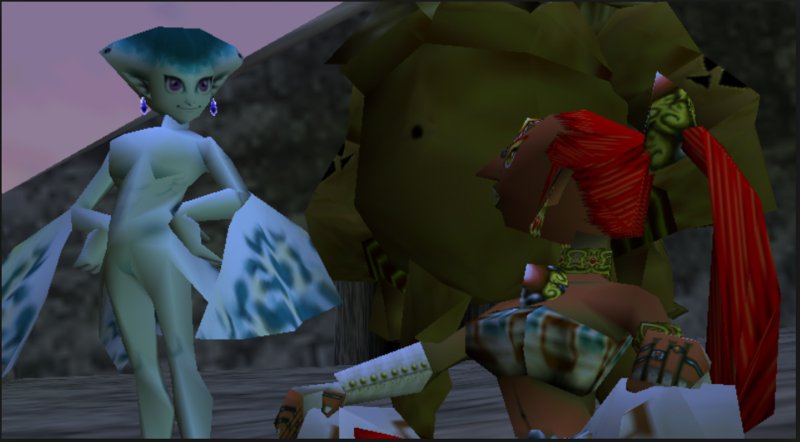 Nabooru used this information to her advantage, employing the child to retrieve the silver gauntlets for her so that she could infiltrate the remainder of the temple and foil Ganondorf’s plans. But why would she even want to ruin Ganondorf? The answer is clear in what she says to child Link, “I’m completely different from Ganondorf. With his followers, he stole from women and children, and he even killed people!” Nabooru, though being the greatest of the thieves, still had value for life itself. This is why I call her a just leader. She did not throw others to the wayside like her male counterpart. 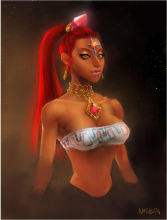 She encouraged her followers and taught them the traditions of the Gerudo without sacrificing the morals of being human. And within this deep moral compass she could sense the wickedness of their birthed King. She knew he had to be stop, and was willing to personally to an end to him. 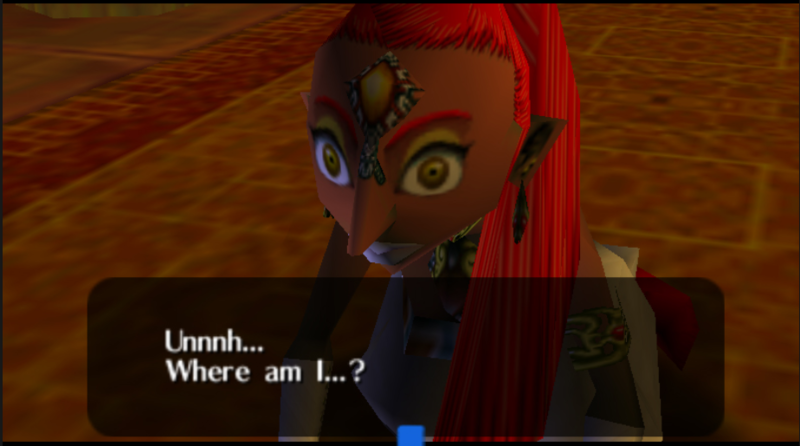 After Link starts the Spirit Temple as a child we don’t hear from Nabooru again until he has gotten to the treasure. This is when we can see just how dedicated Nabooru is to peace. Link witnesses as Koume and Kotake capture Nabooru, and she calls out to the boy. She instructs him to get away, and proceeds to let herself be taken. Nabooru could have easily gotten out of the clutches of Koume and Kotake. All she had to do was betray Link. As mentioned earlier, it would have been extremely obvious to anyone paying attention that Link was no ordinary boy. If anyone wanted a get-out-of-jail free card, he was the ticket. Ganondorf certainly was looking after the boy, and his ‘mothers’ would have known who he was. But she kept her silence, as any good thief does. This is were the seven years of servitude begin. Link, and you as the player, get to skip the seven long and treacherous years that Hyrule has to constantly live through, but the ones who were left behind don’t get that luxury. For seven years her mind belonged to another; she was forced to lead the wickedness that is Ganondorf. She lead her people into his evil deeds, and fought for his cause. I don’t know how much of her own consciousness she was able to hold onto during those seven years, but considering she remembered everything that she had done while under the control of Twinrova, I would say she must have been somewhat conscience. I can’t imagine the mental torture that must have been, knowing that what you are doing is wrong but having no physical ability to stop yourself. The torture continues until and older, and apparently more handsome, Link frees her from Twinrova’s grasps. She reveals to the boy what she has done, only to be instantly captured again. Link defeats the twin witches, and awakens Nabooru as the Sage of Spirit. She takes to her duty with vigor, eager to take down the one who she sees as a threat to not only her race, but the entirety of Hyrule. She aids the other sages in sealing away the wicked pig King, and continues protecting the spirit temple as it’s sage. Does the story end there? Not quite. 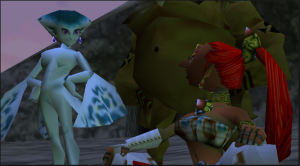 You see, by the time Ocarina of Time is over the Gerudo are in a bit of a pickle. Both of their leaders, the just Nabooru and the greedy Ganondorf, have been taken away. This leaves the Gerudo without anyone to guide them in either the way of good or evil. It is believed that during the events of Ocarina each of the sages die as they are called to the sacred realm, and I for one believe this to be true. I believe that when Nabooru was taken the second time by Twinrova she was killed. This made it so that only her spirit remained, and therefore she could never return to her people. Have you ever noticed that the Gerudo are missing from every Zelda timeline after Ocarina? There is an entire theory here, and I believe that the death of their great leader Nabooru is to blame for this phenomenon. But that is another article for another time. Beauty. Cunning. Just. Leader. These are the words I think of when I imagine Nabooru. She is a woman that I admire and would love to see more of. She never let an unfit ruler influence her, save for mental torture, and held to her values to the end. She aided in the fight against one of her own, demonstrating that the greater good is what matters. She is truly and inspiration, and someone I would love to see more of in future Zelda titles.